Okay, I ran out of time for my intended post, so here is the outfit, content to come. Sweater: Bought in Windsor, England at Laura Ashley while I was on my honeymoon. It was basically my main souvenir, because everything was so expensive. Skirt: I made it a while back. Blogged the details here. Magazine: Mary Engelbreit's Home Companion Great Magazine! This is my favorite of all the outfits you've shared with us. 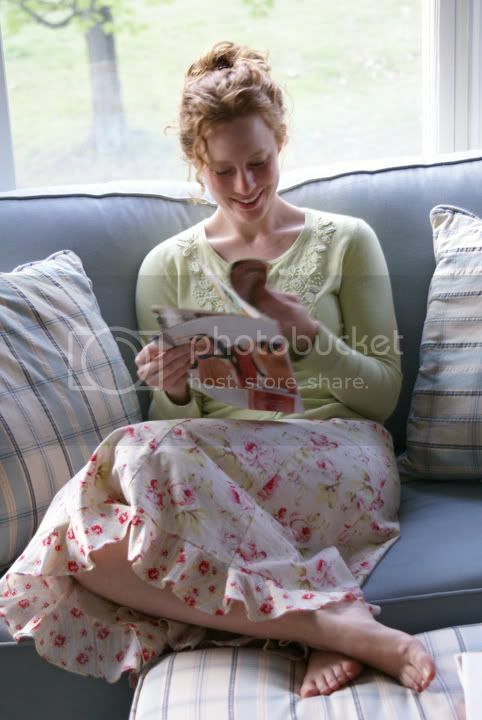 I love the floral fabric you used on the skirt, and the sweater is amazing. I am in LOVE with that skirt! And I don't think that you are not photogenic at all (despite what you say!) You have looked lovely every day this week! I just love this photo! It's so lovely and bright.